Painting like it’s 1899…ooohh yeah! Tuesday was another gorgeous day! My daughter and I spent the nicest part of the day painting in the backyard, and all the paints were packed up before a crazy rainstorm hit so all-in-all it was a perfect day. 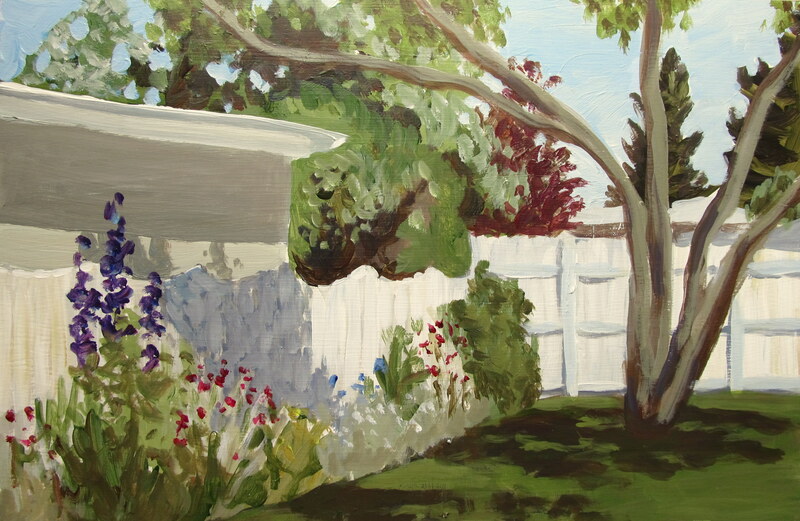 This painting is of the side of my yard where I’ve been slowly building up a perennial bed. I love my yard and garden, but it is a work in progress; I’m still learning about the placement of plants and how to take into account the varying heights of things. The painting looks a bit better than the real thing, though it’s not too bad considering there was nothing there except some tree stumps when we moved in here two years ago. 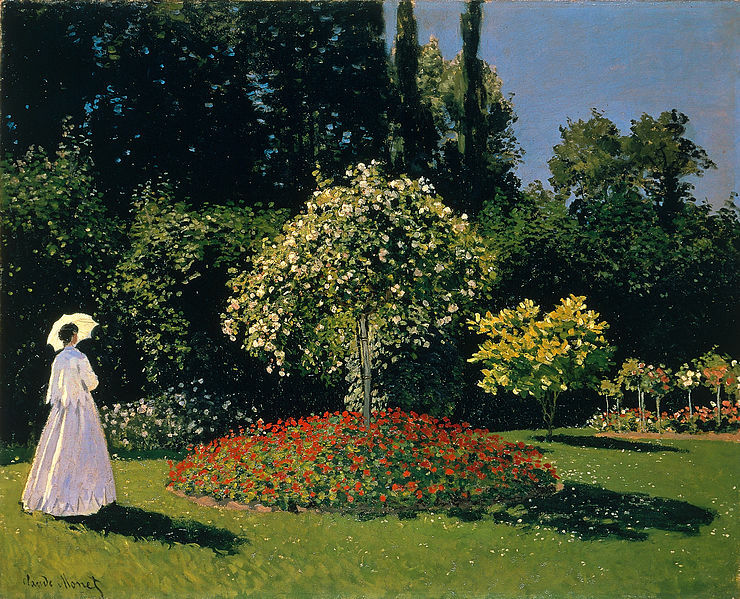 While I worked I was thinking about the paintings Claude Monet did of his beautiful gardens in Giverny and daydreaming a little bit about one day having large, luscious gardens of my own. I would love to expand the garden, but I am finding that even what I have is quite a bit of work so it will take some time. Interestingly enough I had wrongly assumed (or perhaps just forgotten) that Monet had a lot of money and help to keep up his gardens. But he actually first rented the property at Giverny until he had enough money to purchase it and, though he did put a lot of his money into plants for his garden, he preferred to let it grow wild. wow – I just asked not two minutes ago for a picture of the whole border & here it is! even better than a snapshot. I love it! Wow, Dayna, love your new and improved blog! I really, really like your garden painting too. Makes me wish I could paint in a lovely garden like yours.